The blossoms of this yarrow will be bright yellow. Welcome all AtoZ Challenge bloggers! After tomorrow, we go back to our normal blogging programming. This month I’ve focused on the garden, but I write about other things, too. I hope many of you will continue to join me, as I plan to continue following many of the great blogs I’ve run across this month. So, to all of you who have hung in there, congratulations! And yippee! Yarrow grows freely in the Pacific Northwest. Native yarrow is said to be good for a variety of ailments, from toothache to GI discomfort to menstrual cramps. It may have anti-inflammatory properties. However, you have to plant the right variety. 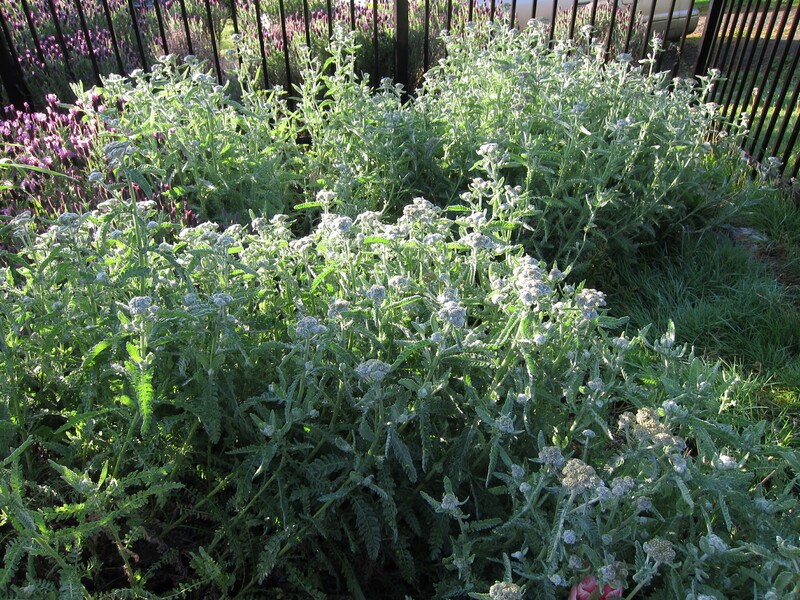 In my innocence, I planted ornamental yarrow in my front yard. It’s pretty, with bright yellow flowers (it’s not blooming quite yet, but any day now), but it couldn’t address health conditions I thought it might help. Native yarrow has white flowers and, at least what I have seen, is smaller and more delicate than the aggressive plants I have. So instead of ingesting yarrow, I had a minor surgery instead, which solved the problem. I’m not fond of doctors, but when you need one, they’re good to have. The yarrow has since threatened to take over one side of the yard. It and the lavender are duking it out. I keep cutting it back, especially since it tends to swallow up a tentative, shy elderberry plant that is growing slowly. Still, I like yarrow’s moxie. I’m intrigued by anything that grows easily. The flowers are pretty, and they’re good for covering bare yard and providing nutrients to my pear tree. I think, though, that I’ll leave herbalism to the herbalists and just enjoy the pretty flowers. I need to be aware of how plants can help me. One nutritionist has tried to educate me about the benefit of nettles. I’m not that brave. As I have digestive issues, I’m sure learning about the benefits of my plants would be useful to me. I have enjoyed your posts and learning about gardening from you. I have enjoyed meeting you too. I hope that we can get together from time to time. Now that the Challenge is nearly over I have to figure out what else to write about… gulp! Yeaaaaaaaaaaaaa we made it. Great job. Nettles are amazing! I love them…love love love them. I follow Dr. John Douillard after reading his book The Colorado Cleanse. Over the years, with periodic cleanses (and these are gentle, mind you), I finally broke a decades-long aspartame habit, and my digestion has improved a great deal. Sometime if you want I can share my book with you. The good news about being done is that we don’t have to come up with content every day! I usually blog once a week and will most likely stick with that for now. We will stay in touch! I only drink green tea or water. I haven’t had pop in God knows how long. My former Naturopath recommended Nettle tea, but I just couldn’t get into it. I am not a regular blogger. I try to find something humorous to say, but I can’t always find something that entertains me let alone try to entertain others. We’ll see what pops into my brain after this event. Take good care of yourself! Could have been a case of a little knowledge being a dangerous thing! Anyway, glad the surgery worked. Yeah, I think someone up there is looking out for me! I don’t think I would have done any real harm, but it wouldn’t have helped, either. I didn’t know there were different types of yarrow. I do know it grows like the dickens. I would never try to make my own herbal concoctions. I hope to continue stopping by after the challenge. Your posts are very interesting. Hi, Susan! I hope you’ll stick around…I’m so glad you’re here! I like playing with herbs in the kitchen…makes me feel like a mad scientist. Bwwwhhhaaaa! I do try to be careful, though. Yep! I’m pretty happy about that. Someone up there is keeping an eye on me for sure. That sounds like a useful plant if you get the right kind. Definitely useful…but still pretty even when it’s not. Thank you for your support this month. It is much appreciated! Yippee is right! We’re almost there. Just posted my “Z” post! We made it! Woo hoo! Yup, it’s better to just enjoy the flowers if you’re not sure how to manage their medicinal properties. In my case, just enjoying the flowers is wise on so many levels! Thanks for your visit and for co-hosting this blog challenge. This was my first AtoZ, and it has been an incredible experience!